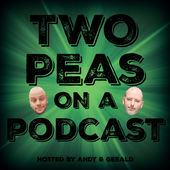 Gerald is joined by Peter (Podstalgic Podcast) to discuss and compare our Top 5 movies that were spawned from TV shows. This bonus episode was a lot of fun to record. Please enjoy and share! Find our guest, Peter, on Twitter @Podstalgic or on PodBean HERE. Intro: “With You” by Linkin Park. 2000 Warner Bros. Records. All Rights Reserved. Outro: “Charlie’s Angels (Theme)” by Jack Elliot/Allyn Ferguson. 1976 Sony. All Rights Reserved.